The new CLA Shooting Brake, from £28,245 OTR. With this latest version, the unmistakeable exterior design has been honed and refined with a range of new styling elements, including new-look front and rear aprons. The spacious, richly appointed interior also benefits from exclusive new trims and upholsteries, as well as new tech such as advanced smartphone integration. Aerodynamic performance is exemplary, enhancing handling and efficiency, and helping to minimise noise and vibration within the cabin. The Sport model with its energetic bodystyling is equipped with a single-louvre radiator grille in diamond design, visible twin sports tailpipes, and 18" 5‑twin‑spoke alloy wheels, all created to turn heads. If you want to enhance the sporty performance of your CLA, the AMG Line offers lowered comfort suspension, which lowers the front axle by 20 mm. Looking good: 18" AMG 5-twin-spoke alloy wheels, LED High Performance headlamps and AMG bodystyling comprising front apron, rear apron and side skirts are standard. Adding to the distinctive look of this CLA, black mirror caps, black beltline strips and heat-insulating privacy glass in the rear windows enhance the visual appeal. As athletic and dynamic as you could possibly get, the CLA 250 AMG model line features AMG bodystyling all round, 18" AMG 5-spoke alloy wheels and a lowered sports suspension with AMG speed-sensitive sports steering. And there’s plenty more to catch the eye, such as the LED High Performance headlamps with headlamp wash or the red-painted front and rear brake calipers with ‘Mercedes-Benz’ lettering on the front calipers. 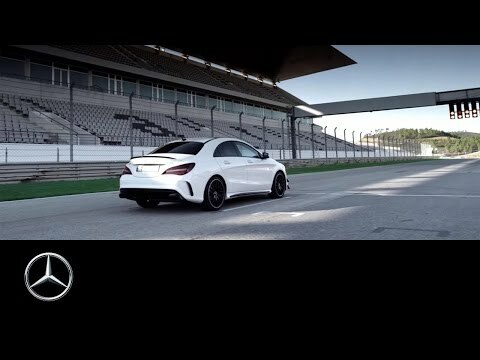 The Mercedes-AMG CLA 45 4MATIC is a thoroughbred sports car, complete with its top-of-the-range 381 hp 4-cylinder petrol engine. Plenty of athletic features support this powerful set-up: from the AMG Sport suspension and transmission to the performance-orientated 4MATIC all wheel drive system. For dynamic looks the CLA 45 4MATIC model has its unique AMG bodystyling with high-gloss black details on the front apron splitter, side sill panels and rear apron. 19" AMG multi‑spoke alloy wheels in titanium grey finish complete the sporty exterior. View prices on models in the ebrochure below. With its surging profile, sweeping lines and contoured surfaces, the CLA Shooting Brake is a celebration of speed and motion. The Sport model features the diamond radiator grille in black as standard, and is complemented by a reworked front apron with chrome accents. At the rear, there’s a twin-pipe exhaust with trapezoidal tailpipes, new-look apron and partial LED taillights are standard. To maximise safety, comfort and efficiency, the CLA Shooting Brake is available with new LED High Performance Headlamps. This advanced technology adapts illumination to suit a range of driving conditions - from motorway driving to weaving along country roads. The ‘coming home’ function lights your path to and from the car. LED headlamps also provide illumination that’s closer to natural light, so it’s a more relaxing driving experience. They’re more efficient too, using up to 70 percent less energy than other headlamps. CLA Shooting Brake "Hiding Impossible"